Welcome to my review of Arbitrage Underdog 5.0, I had heard a lot of buzz about this software and read a few good review so I purchased the 5th version when it was released back in April 2017. I’ve had a couple months to play around with it and provide an honest review. Before I actually get on with my review of Arbitrage Underdog 5.0, let me briefly explain what arbitrage is and why it is probably one of the quickest ways to make some money. Arbitrage is basically taking advantage of a price difference of a product in two markets. For example, before I got involved with affiliate marketing, I was doing retail arbitrage through Amazon. I used to find cheap deals in local shops or other online retailers and sell it for a bit of profit on Amazon. I wasn’t successful with this method but it can be a lucrative business if done correctly. It’s a neat software that searches Craigslist for posts that are in need of a service, if you are aware of Craigslist, you will know there are many types of services that people use Craigslist to advertise for. The software is also capable of searching the database of the freelance website Fiverr for people who are offering to do the same type of service. 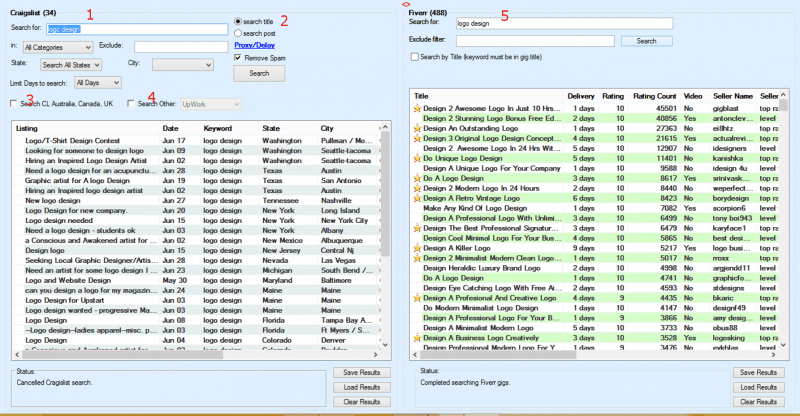 As shown in the image above, arbitrage underdog 5.0 has 2 sections, the left-hand side pulls in the information from Craigslist, while the section on the right extracts information from Fiverr. Get rid of duplicate posts by ticking the spam box. Check this box if you want to search other websites instead of Craigslist. Search Fiverr for sellers that provide the service you are looking for. Your next task is to message as many clients as possible and hopefully, some will respond, if they agree with your proposal and price, you simply outsource the job to a Fiverr seller of your choosing. You pocket the difference between what the Craigslist client paid you and what you paid the Fiverr seller. There are two versions of Arbitrage Underdog, the basic version lets you search the Craigslist database for the US but not anywhere else. With this version you can search for gigs state by state, this is a little annoying since the US has 50 states, but it still gets the job done. The Black Label edition lets you search all 50 states at once and also has the ability to search Craigslist Canada, UK, and Austrailia. This will greatly increase your chance of finding leads, this is the version I have. Also available with Black Label edition is the ability to search Upwork, Indeed UK & US, Kijiji,PeoplePerHour,FlexJobs and Guru.com. If you want to run a service based arbitrage business, it’s best you buy the Black Label edition. The Black Label edition is a lot faster and provides more posts and you can load proxies into the software so that your IP isn’t blocked by Craigslist because of too many searches. That last feature is really useful if you decide to make heavy use of this product. As you may or may not be aware but too many searches on Craigslist can lead to your IP being blocked for 24 hours. They did this so the system isn’t abused by scammers and other criminal elements. However, this feature means that you have a limit to how many searches you can do. Arbitrage Black Label solves this problem by letting you load proxies into the software, every search is then rotated between each proxy, so you can search as many times as you wish. Like I said earlier, you will only need the proxies, if you are going to be using the software a lot. This is one of the few products that I have purchased from warriorplus that does what it says will do. It is a great piece of software and although I haven’t had success yet in finding leads, I know I can if I did search for leads on a more consistent basis. The members area is easy to navigate and they have a decent amount of training showing you how to use the software to its full potential. They provide you with email templates that you can use to contact potential clients for your service and give you a list of the most popular services people on Craigslist look for. There are also extra bonuses for those who purchase the Black Label edition. A couple of the bonuses are decent and one was expired, personally I think bonuses that vendors offer should complement the main product. Many times, however, bonuses just distract the buyer because it’s a whole separate product in the same niche. Fortunately the bonuses offered with Arbitrage Underdog 5.0 can help you further your arbitrage business if that is what you are looking to do. There is also a whole separate training from Brett Rutecky ( well-known internet marketer). This training is useful if you want to build a long term business around arbitrage. This type of arbitrage does bring rewards and risks, you can make a decent amount of money once you start to find leads on a consistent basis. However, because you will always be the middleman when running an arbitrage business certain things will be out of your control. You have no assurances if the leads from Craigslist will pay you for the service or if the sellers from Fiverr will do a good enough job. There are a few steps you can take to reduce your risks. If you plan to only use Craigslist for leads, I advise that you only look to provide a service that isn’t very expensive. Offering gigs like logo design, eBook cover, banner ads etc will not be expensive and so these are the types of services that you should look for on Craigslist. If you look to offer services like Web Design, SEO, Social media marketing etc, do not search on Craigslist, look for these types of leads on the Freelance websites like Upwork,PeoplePerHour or Indeed UK,US. There is a lot more protection for you from these sites should anyone try to back out of an agreement. If you want to do this full time, I do advise that you build your own website around the service you want to provide. There is another way you could use Arbitrage Underdog, a way in which you wouldn’t be required to look on Fiverr for sellers. You look for companies that provide white labelling for their services, this will work best for services like Web design,SEO, Digital Marketing etc. You get the services at Wholesale prices and then resell them at your own price. You will have your own website with all the products listed as your own, this will instill more confidence in your potential clients that you are running a proper business which will lead to a higher likely hood of landing customers. For example, ‘Web design white label’ or ‘SEO reseller’. Personally, I think this method is a better long term solution for an online business, you have a website to build your brand and drive traffic to and you also find leads through an awesome piece of software. Arbitrage Underdog 5.0 is a legitimate product that does what it says, it is one of the few products that I have bought from Warriorplus that I endorse. You can make money with this, it just depends on how much effort you put in. People have built long term businesses from the arbitrage model and you can with Arbitrage Underdog but it will require more than just looking for leads on Craigslist and outsourcing the work on Fiverr. If you are looking for some extra side income, I do believe this piece of software can help you do that. You just need to be consistent and apply the training, the creators of this product are constantly improving it and always on hand to answer any questions you may have. Have you used this product? what was your experience like, please let me know in the comments section. What a great and complete review of Arbitrage. I myself had no idea that these kind of programs were available or in use. Sounds like a great idea but does have a few drawbacks. I like the alternative way to use it with the companies that offer white labelling. This seems to be the better way to go with this product. I will give it some thought and revisit your site over the weekend when I have a little more time to read through everything. Nice to know its not a scam, and will give it some serious thought. Good review of Arbitage Underdog. I wasn’t aware that this type of business was being done online. Middlemen have been around for a very long time. This software seems to put your squarely in the middle, with enough tools to be successful. To me it’s an interesting concept, but not one which I would pursue. Historically the guy in the middle is the one who gets squeezed. Thanks for the review. Well I’ve certainly heard about arbitrage online before but I had no idea how clever it was – i suppose you can use any sort of second hand selling platform to pull this off, right? How much success have you seen through this way of making money online? Do you still use it to make money with? Yeah, you can out source it to anyone you want as long as you know they are reliable. I haven’t been successful, but that is my fault because I haven’t been consistent in using it. I hadn’t heard of Arbitrage before. Thank you for introducing me to the subject. From what I understand, you connect the service requested with the provider and earn a fee. Is that right? Also, is is geography limited? Seems to me that the service offered and the provider have to be fairly close geographically, don’t they? No, with Arbitrage, the person who requires the service will not now that you will be outsourcing it, it’s not like a fee, you are just charging a bit more than what the service provider is charging you. Geography doesn’t matter, you can do this from anywhere in the world as long as you have internet service. Hi Minhaj, I did not know that there is a tool for this process. As a trick to earn money online, I have heard it again on forums and social media but I thought that it was a waste of time. Anyway, I may buy it. How much money can you make with this business model? It is a good business model and you can make a good living if you are consistent and apply the training. It won’t come over night but it does work. Some people are making six figures from this model and some people don’t make a dime, it’s really up to the individual on how much he/she can make. this is an interesting way of making money. I guess you have to understand a bit of what you are offering? How much can you make from arbitrage?